Great deal on this one and a fantastic game. May be possible to use 3% FB code for new customers but I believe they have removed the option today. Please note: The CD key is only redeemable via steam. 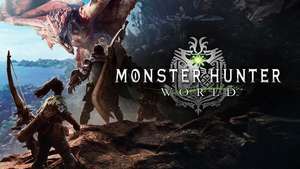 A Living, ever-changing open world awaits you in Monster Hunter: World. Monster Hunter: World is complex, detailed, and full of the depth you'd expect in a classic RPG. Become a better hunter with every fight in Monster Hunter: World. Improve your weapons, gear, and abilities with every beast you slay! In Monster Hunter: World you'll experience a main hub full of NPCs, ways to gather quests, purchase weapons, craft armor and even cook/eat! I have been waiting for this moment!!!! How is it on the PC? Gameplay wise, I haven't had any issues but I know others have. Also I wouldn't recommend using keyboard & mouse, controls arent that great. Definitely best played with a gamepad. The game is awesome but crashes. Err12 graphics failure. I'll wait until it's sub-£20, the player count is still going strong.